In 1958, Falk N.V. was established in Brussels as a continuation of the "Nader" company, a silversmith from Anderlecht. In 1962 the shares of this company were transferred to Pieter Paul Van Achter Sr., who settled in Wespelaar-Haacht, 25 km North East of Brussels. At this time, the production of decorative copper cookware was gradually starting to replace the waning galvanic activity. Bringing his degree in industrial engineering and metallurgical experience, Paul Van Achter, son of Pieter Paul Sr., took over manufacturing and trading in 1977. 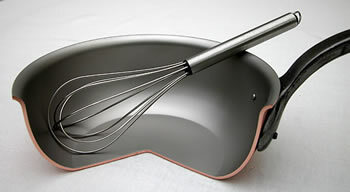 With production and design moving to professional grade culinary cooking equipment, the company changed its name to Falk Culinair N.V.
Paul pioneered the use of bimetal technology in the production of copper cookware. The bimetal technology approach involves laminating a large copper plate directly onto a fine layer of stainless steel. This bimetal was designed to replace the softer tin layering method (which has a melting point at 230 ° C) that had been used since the beginning of professional cookware production. This bimetal structure is regarded today as the gold standard in the manufacture of cooking equipment. Falk Culinair was ahead of its time in the use of this method, which has been widely adopted by other producers. Copper is chosen for its excellent cooking characteristics and superiority to tin, which is less durable, susceptible to oxidation, and difficult to maintain. With his own culinary experience and collaboration with professional chefs, Paul strived to endow each copper pan made by Falk with optimal design and function. Today, the company Falk Culinair is led by Jan Van Achter, the youngest son of Paul. With his education in International Economics, he aims for global distribution of FALK’s beautiful and functional cookware. Tradition and technology remain the primary themes of the "FALK copper cookware" philosophy. 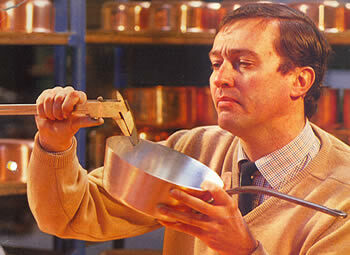 Jan affirms that “my challenge is to continue to manufacture the finest handcrafted cookware in the world. Every FALK pan is made by today’s high standards with the use of exclusive materials without compromise and with a taste of tradition". In cooperation with our skilled and meticulous staff, we offer a product that is exclusive in its composition and unique in its capabilities - today and for many generations to come.